Yes, only in Seattle would a mayor propose that many new taxes in his first term. And we would love him for it! Only in Seattle. Only here would a mayor kick off his bid for re-election by announcing two new tax increases. It wasn’t long ago that some rules of political gravity still applied. If you had to raise taxes, do it early, so voters forget by the time you’re on the ballot. Also, as much as you can get away with it, talk up the benefits and downplay the costs. 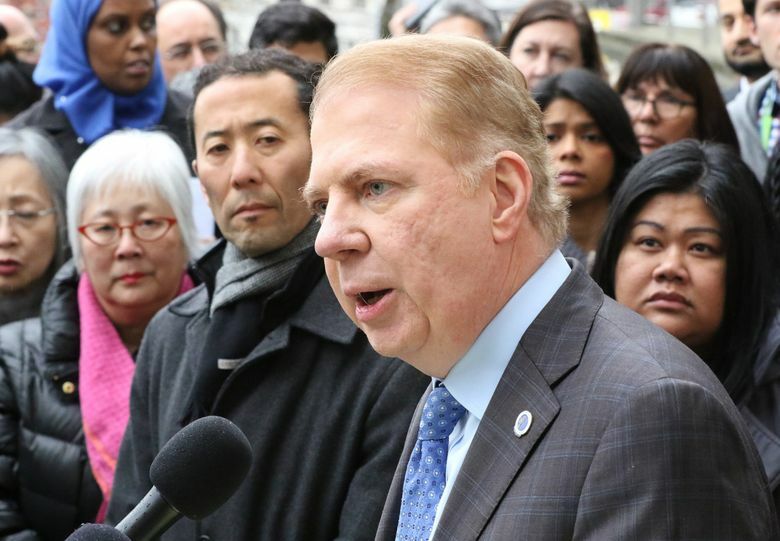 But Seattle Mayor Ed Murray showed with his State of the City speech just how defunct are the old rules. “I was kind of blown away. It’s his re-election year, and he’s running on ‘I’m going to raise your taxes again. And again,’” said Eugene Wasserman of the North Seattle Industrial Association, a group of old-line maritime businesses that has tussled with the city on taxes in the past. Murray may already be the most taxing mayor in city history. By my count, the city has passed seven higher taxes just in the mayor’s first three years. The two he just announced — a $275 million property tax for the homeless and a 24-cents-per-can soda tax for education — would be the eighth and ninth of his first term. The first seven were property tax hikes for parks, preschool, roads and affordable housing; a car-tab and sales-tax boost for buses; higher business taxes for police; and a tax on guns and ammunition. Five out of these seven were blessed by the voters, often overwhelmingly. A tax for publicly financed elections also passed, but it was done by initiative, not by the city. Wasserman, who ran a campaign arguing the nearly-billion-dollar roads levy in 2015 was too bloated (it almost tripled the previous levy), said he’s concluded that resistance is futile. The proposed homelessness levy in particular seems to reflect this reality. There’s no question we have a homelessness problem. But the approach the mayor announced was to start with a figure, $55 million more per year, which is a simple doubling of what the city currently spends on the problem. And then he announced a task force to specify how to spend the extra money. Isn’t this backward? Seems like we should pick a goal, identify how to achieve it and then calculate how much it would cost? Last year there were 10,700 homeless people in King County; about two-thirds, or 7,000, were in Seattle. Spending $110 million annually on 7,000 people means nearly $16,000 per person per year. I don’t know if that’s just right to make a dent. But on a per beneficiary basis, it’s got to be among the costliest programs ever proposed in the city. Murray says what he hears from Seattleites is tax us more, not less. His comments came in an interview this week on The Seattle Times’ politics podcast The Overcast. I’ve heard the same at public hearings in Seattle, with citizens pleading for more spending. It’s how we roll. My worry is that in the meantime, government is getting unsustainably swollen — the city has added 1,239 employees just since Murray took office. Only one public official is fretting it might all pop. The new King County assessor, John Wilson, has been saying that “skyrocketing” tax bills are helping drive some people of modest means out of town. Last year, after property tax bills went up an average of 15 percent in the city — which was $600 on the median bill — Wilson suggested it couldn’t last. But that was three tax proposals ago. The beat goes on in the city of progressive dreams.